Cleans petrol injectors with pressure specially formulated chemicals for all types of MPFI vehicle. Able to regulate pressure for cleaning. Timer is provided to cut off equipment at desire time. Graduated glass burette for clear reading. Individual fuses for the Main's Injector cord. High quality powder coated cabinet. Can check Flow test, Leak test Volume test. 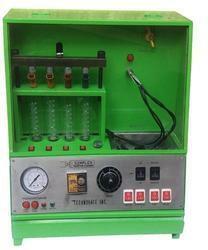 Looking for Injector Cleaning Machines ?